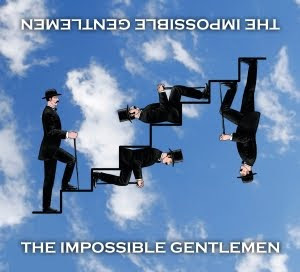 From the outside, the Impossible Gentlemen album promises to be something a little different, its music hall psychedelia come Escher-Magritte cover avoiding the jazz conventions of the monochrome Nordic landscape and the uncomfortable photo session band shots. 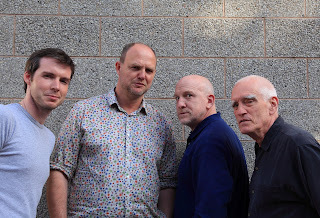 On listening, we discover the results of an impressive four part collaboration between UK guitarist Mike Walker, pianist Gwilym Simcock, and the American classics, Steve Swallow on bass and Adam Nussbaum on drums. Walker and Simcock take on the lion’s share of composition duties, Nussbaum contributing the one closing track. A truly fine record it is, surely now raising the profile of the relatively unknown Walker, who’s frustrating under-heard phenomenal guitar playing and compositional abilities undoubtedly form the core force of this great record. Continually rising star, Simcock, is on top form as ever. Swallow and Nussbaum once again show why they are such highly rated players. The incendiary paced opening track, ‘Laugh Lines’ immediately grabs you by the jugular, its ultra precise boppy head played in unison by Walker and Simcock. An interlaced solo follows from the same, Walker’s jagged recursive lines having a strangely disorientating effect. The soothing introduction to next track, ‘Clockmaker’ eases any disquiet, widening out to a warm and embracing tune statement that Swallow picks up and channels through into a sweet high register solo, with Simcock’s sweeping harmonic flourishes then adding to the richness. All is well in the world. The wistful elegance of Simcock’s opening to ‘When you Hold Her’ is a quite beautiful piece of playing, perfectly setting up the piece’s introspective grace. The open arms and open heart of the tune section slowly builds to a deeply moving and near-heartbreaking feedback-sustain guitar solo from Walker. This spine-tingling encapsulation of the essence of upstanding human dignity is an undoubted highlight of the album. The mood intensity is then moderated by the cheeky perkiness of ‘You Won't Be Around To See It’. I’m not entirely at home with the tune head on this track, but all is forgiven when the track kicks with a bit of tasty muted piano string riffing from Simcock. Walker’s solo gets nice n’outside on us, all the while maintaining a driving forward momentum, stitched together with the mean groove emanating from Nussbaum and Swallow. A regular from the Walker live set, ‘Wallenda’s Last Stand’ is given a French sounding twist, with some melodica playing from Simcock, which works perhaps surprisingly well. Walker is especially under-stated here, the directness of the playing making way for well-crafted and richly melodic improvisation. Swallow and Nussbaum apply just the right accompanying balance to make the whole thing work. The unashamedly sentimental tone of next track, ‘Gwil’s Song’, nods to the very best of Metheny. First up for a solo, Swallow sounds especially lush, continuing in the spirit of Walker’s airy melody statement. A short introduction from Nussbaum sets up the pace for the neo-boppy ‘Play the Game’. Following the crisp tune head, Walker delivers line after line of decentred firecracker improvisations that seem to twist and writhe in on themselves to great effect. Swallow’s driving bass comes through warm and strong to assist, as Simcock then takes over the reigns with some intricate but perfectly coherent improvising. The deep dark blues of closing track, ‘Sure Would Baby’ takes quite a different tack to the rest of the album, the Chicago blues mood delivered by Walker’s thick overdriven tone with a road hardened slurriness, eventually taking on an edgy outsideness. The playing here has a depth of feel and expressiveness all too little heard in the jazz guitar sphere, much to its detriment in my opinion. This is a really great record, no argument. It deserves to become an Anglo-American classic. Here’s to hoping it will. Buy it. You won’t be disappointed. The Impossible Gentlemen are on tour right now. Don’t be a damn fool and miss them now will you? Details are on the Impossible Gentlemen tour page. More reviews of the record available on the Impossible Gentlemen album page.